This study examines the educational reforms init iated by both the Aligarlil and the Muhainmadiyah movernents in India and Indonesia, as one of the by-products of the colonial encounter. It focuses on the formative period of the Muhammadiyah Anglo-Oriental College (1 877-18 98) at Aligarh and the Muhammadiyah schools (1911-1923) in Java. It is argued that the educational reforms promulgated by the two movements st emmed fkom the conviction that existing Muslim traditional institutions were incapable of meeting the changing needs of a Muslim society living under colonialism. The British and the Dutch, who pursued their impenal interests at the expense of the colonized, left Muslims with little choice but to adjust their activities to the nonns of the colonizers. Ahmad Khan (1817-1898) and Ahmad Dahlan (1868-1923) were thus inclined to rethink Muslim traditions, including education, with a view to deciding what was to be salvaged and what was to be discarded. One of the consequences of this introspective and self-critical joumey was extensive educational reforms. Traditional Muslim education in both hindia and Indonesia was conducted on the bais of the conservative view which conceived of Islam as a unit of moral and spiritual guidance revealed by God to Muhammad and transmitted from one generation to the next. This view chose not to recognize the fact that Islam had always been in contact with foreign civilizations and had, in turn, been transformed by them. This traditionalist view of Islam also propagated more reactionary sentiments among Muslims who viewed any new developments under colonial rule as un-Islamic. The traditionalists did not recognize that Islamic learning itszlf was a product of a liistoncal dialectic by which Islam interacted with foreign traditions. They had little cognizance of the fact that their Muslim predecessors had, creatively, adopted foreign traditions to improve their social and economic position. Education among Muslims in pre-colonial India and Indonesia was marked by its emphasis on the teaching of religion. The typical curriculum included the traditional (manqilat) and rational (ma'qulat) sciences developed in the medieval period. Concemed as it was with the preservation of Islamic traditions, education was characterized by rnemorization. The Qur'an became the subject of study par excellence. From an early age, students were trained in the skilled recitation of the Holy Book. Next, they .would memonze the verses of the Qur'an, albeit with little attention paid to their meaning. Reciting Qur'anic verses became a routine activity as it was deemed to be a form of 'ibadah (worship) which would ultimately being Divine reward. Even though economic concems were not entirely ignored, they were secondary to religious ones. In India, traditional education was able to survive fiom one generation to the next only with the support of the govemment and private individuals. Almost all the emperors in the Subcontinent were known to have promoted the establishment of mosques and machsas. They also donated land and money to the financuig of education. Private individuals also contributed voluntary donations in the form of waqfland or - money. In Indonesia, the 'Ulama' played an important role in the establishment of traditional institutions. Generally, they were men of means who were concemed with the propagation of Islam. The 'ulama' established mosques and pesantren (boarding schools) to serve as primary and advanced institutions of leaming, respectively. The presence of the British and the Dutch, however, brought many new problems for Muslims in the form of policies which proved difficult to follow. The British government in India, for example, replaced Penian with English as the official language. Unfamiliar with the language of the new rulers, Muslims found theinselves ill-prepared for admission into goveniment service. Similarly, the Dutch govemment in Indonesia required a working knowledge of the Roman script of its civil servants. Here too, Muslims were put at a disadvantage since their schools employed the Arabic script in their instruction. As the British and the Dutch were primarily interested in trade, education was of marginal concem to them. This is not to suggest that they initiated no educational programs. However, these programs were hardly cornmensurate with the economic benefit they derived fiom the colonized countries. Worse, in the case of the Dutch in Indonesia, a basic elementary education was reserved for Europeans, indigenous Christians and the children of aristocrats. In India, it was not until 1835 that the British govemment promulgated a program for public education. The Dutch were to follow the British example at a much later date. It was only at the begiming of the twentieth century, following the declaration of the "Ethical Policy," that the colonial govemment in Indonesia established the first public schools. British and Dutch educational programs provided few benefits for Muslims; they raised, instead, a number of dilemmas. In India, the govemment's disinterest in the people's aspirations for religious instruction engendered frustration. Government funding for English education simply did not include any provision for religious instruction. In the first instance, this policy made Muslims reluctant to attend government schools. At the same tirne, traditional institutions suffered fiorn want of financial resources. In Indonesia, the situation was not much different. The Dutch government paid no heed to traditional education, nor did it accommodate elernents of the traditional system in its educational prograin. Instead it imposed a new system designed for the promotion and preservation of colonialism. Until the establishment of the Muhammadiyah in 19 12, govemment schools were still exclusively nui for the aforementioned classes. Here too, religious instruction was ent irely omitted. The reforms conducted by the Aligarh and Muhammadiyah movements offered relevant solutions to the problems facing Muslim education. Both Ahmad Khan and Ahmad Dahlan were keenly aware of the fact that Muslims could not retain their traditional mode1 of educat ion. Modifications and adj ustments were necessary in light of the new developments engendered by the colonial presence. Moreover, the two scholars contrived to realize their vision by calling on people to establish new institutions to help Muslirns both to improve their economic st at us and to appease their dernand for religious instruction. Though sharing the same goals, the Aligarh and Muhammadiyah reforms often took different forms. This is attributable to the varied backgrounds of the respective founders, the socio-religious conditions prevalent in either country, and the nature of coloniaIism in each. Ahmad Khan was a govemment civil servant and well acquainted with Englishmen. From them he became acquainted with Westem t hought and observed Western civilization first hand during his trip to London. This combined experience convinced him that the only way to improve the econornic and social status of Muslims was through the adoption of Westem sciences in Muslim institutions. He thus called on his contemporaries to establish an institution of higher leaming. His drearn was realized in the form of the Muhamrnadan Anglo-Oriental College (MAOC), founded in 1877 in Migarh. This college received support fiom govemment, individual Englishmen, and Muslim and Hindu elites. In an effort to bring the Muslims and the British together, the MAOC recruited lecturers and staff fiom among the English. Its students, who came fiom across India, included Muslims and non-Muslims. The college could not serve the majority of Muslims as the fees it charged exceeded the means of most of the Muslim population. However, for those who could afford to attend the provision of residential housing, the college fostered character building and cornradery bet ween st udents, a factor which helped shape the future leadership of the Indian Muslims. Ahmad Dahlan, the founder of the Muhammadiyah, was a pious man. His education had been entirely traditional. He went on pilgrimage to Mecca twice and stayed there to continue his studies. He becarne a khatib (preacher) in the mosque of the Yogyakarta Sultanate as well as a batik trader. He was also a member of Budi Utomo: where he met with Dutch-educated scholars. Such act ivit ies height ened his awareness of the need for the religious and economic improvement of Muslim society. Thus, he believed that Muslims had to be conversant in modem sciences while at the same time ret aining their religious identity. Ahmad Dahlan pursued his drearn by establishing a school in 1911, a year before the Muharnmadiyah was established as a mass organization. With the financial support of the members of the Muhmadiyah, those of Budi Utomo and the govemment, other Muhammadiyah schools were built in subsequent years. The Muharnrnadiyah schools adopted the government curriculum for modem sciences and applied new methods to the teaching of religion. 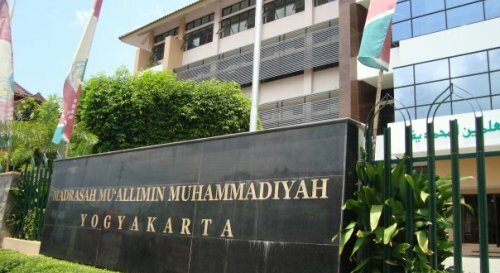 Within this system of education, the Muhammadiyah was able to equip its students with the knowledge and skills necessary to secure employment while at the same time ensuring that they remained devoted Muslims. Through their efforts at reform, both the Aligarh and Muhamrnadiyah movements sought to retify the weaknesses of the previous system of education by discardïng its unnecessary elements and adopting new ones from the West. These efforts did, of course, bear firuit.